The seventh annual offering of this unusual and life-changing field course will take place once again in three locations - Denali National Park, Yukon-Charley Rivers National Preserve, and the Fairbanks Summer Arts Festival. This year we'll get the added advantage of spending an extra full day in Denali. Led by adventurer-composer Stephen Lias, nine participants travel into the wilderness of Alaska accompanied by scientists and guides; gather ideas, experiences, and inspiration; and then quickly write chamber pieces that are premiered by top players at the Fairbanks Summer Arts Festival. Participants should be prepared to live in rustic conditions and be physically fit enough for strenuous mountain hikes, stream crossings, etc. Participants must also be trained composers (professionals, university faculty members, or students currently enrolled in a university composition program) with experience preparing their own manuscripts and writing chamber music for various instruments. This is not a "class" or "workshop" in that there is no instruction included (although we all learn from each other). Instead, it is a guided adventure trip for composers. Those without sufficient background may be ineligible. If in doubt, EMAIL ME with questions. Food “on the go” and while in Fairbanks. Clothing and gear you’ll need on the trip. Depending on your level of preparedness, this may be less or more. To help with this, I’ve made THIS VIDEO. Everything else is included. We provide all the transportation including shuttles, cars, vans, bush planes, etc. once you arrive; lodging while in Fairbanks; and all the food while in Denali and Coal Creek. July 10 (Tuesday) - Participants meet at the airport at 9:00 AM and are transported by van down to Denali. After lunch and a group meeting at the Murie Science and Learning Center, we'll head back to our field camp on the Teklanika River. July 11-14 - Four full days of activity in the park. 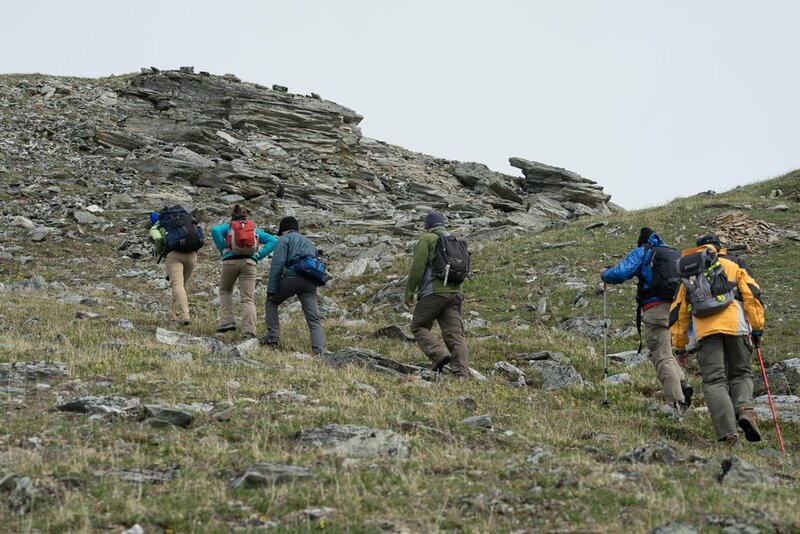 We'll be taking strenuous day hikes through many different terrains and ecosystems from boreal forests to alpine tundra. This part of the trip is "unplugged" (no tech devices). July 15 (Sunday) - This is an exciting travel day. We'll leave the park, return to Fairbanks, and then fly by bush plane out to Yukon-Charley Rivers National Preserve where we'll land on a gravel strip at the historic Coal Creek Mining Camp. July 16-18 - Three full days at of composing time at Coal Creek. There is power there, so everyone can use their computers. July 19 (Thursday) - Return by small plane to Fairbanks and check in to the University of Alaska dorms. July 20 (Friday) - Composers meet performers and have first rehearsals. July 21-22 - Rehearsals and various activities in Fairbanks, including a visit to the Museum of the North to see John Luther Adams' iconic installation "The Place Where You Go to Listen". July 23 (Monday) - Travel back down to Denali for various music activities as well as premiere performance of all nine new pieces in the auditorium of the Denali Visitors Center. July 24 (Tuesday) - Second performance of composers' pieces in Fairbanks. July 25 (Wednesday) - Participants depart. Those who wish to extend their stay may do so at their own expense. The Festival's new music ensemble is called Corvus and it is made up of seasoned new music experts, many of whom are from New York City. Part of the fun is that we don't tell each participant which instruments they're writing for (usually trios and quartets) until the first day, so I'm not going to reveal that here. More information about Corvus on the ABOUT link above. The best way to get a sense of this trip is to use the PREVIOUS YEARS link above and look at all the pictures. Yes! (Bearing in mind that you are choosing to come to a wild place with wild animals and steep mountains and have an adventure.) At all stages of this trip, you'll be accompanied by guides, leaders, scientists, and National Park employees whose job is to make sure you are safe. You'll be given some instruction on how to handle bear and moose encounters, and supplied with bear spray when appropriate. You wouldn't be interested if you didn't want an adventure, right? But we'll make sure this adventure isn't your last. Can I use electronics in my piece? Sorry! Our performances for this trip will be entirely acoustic. On the bright side, though, we'd like for all the composers to have images or videos projected while their piece is being performed. Containing over 12,000 square miles (8,687 km2) and the highest peak in North American, DENALI NATIONAL PARK is the third largest park in the USA. It is home to a host of unusual plants and wildlife, and it's vast interior remains completely wild. There is only one road into the park and private vehicles are not permitted past mile 15. YUKON-CHARLEY RIVERS NATIONAL PRESERVE is a bit larger than Yellowstone and sits on the eastern edge of Alaska near the Canadian border. Rustic cabins and historic sites are reminders of the importance of the Yukon River during the 1898 gold rush. Peregrine falcons nest in high bluffs overlooking the river, while rolling hills that make up the Preserve are home to an abundant array of wildlife.